The Tinkler family record in the 1901 census. Extract from the Tinkler family entry in the 1911 census. Pte B.R. Tinkler's Medal Index Card. Pte B R Tinkler's record in the Essex Regiment medal roll. Bernard R. Tinkler is the name of one of the men on the Bottesford ‘church list’ of WW1 Servicemen. Bernard Robert Tinkler was born in Bottesford in 1899. His father was William Tinkler who was born in Woolsthorpe in 1859 and baptised on the 5th of June. His mother was Maria Hollingsworth who was born in Easthorpe, Bottesford on the 22nd October, 1867. William and Maria married on the 10th October, 1892, in Bottesford. At the 1901 census, they lived at 3 Retford Cottages, Bottesford, and William Tinkler worked as a bricklayer’s labourer. His wife had the name Jane in this census, rather than Maria. There were five children. The oldest, Annie Hollingworth, was twelve years old. The others were Florrie (aged 7), Mabel (6), John (4) and Bernard (2). Annie was born before William and Maria were married. In the 1891 census, Annie Hollingsworth was 2 years old, living in the home of her grandparents, Joseph Hollingsworth (a 61 year old platelayer) and Harriett Hollingsworth (53), their children Maria (24, a domestic servant), John (17, an ironstone labourer) and Robert (11), and also her sister Sarah (5). It seems that both Annie and Sarah were Maria’s daughters, but it is not certain that William Tinkler was their father. Ernest was born in 1901 and died in 1904. Annie Hollingsworth was not living with them. She was probbly the Annie Hollingsworth that was married in 1908 in Grantham to Thomas Christian Horner. The Tinkler and Hollingsworth families were closely connected. Bernard’s father William had a sister called Elizabeth Tinkler who married Richard Hollingsworth in 1886. On Saturday 10th February, 1917, the Grantham Journal reported that Bernard Tinkler, described as a labourer, along with Bernard Norris (16) John Branston (16) James Pacey (14) who were all apprentices, was charged and pleaded guilty to wilful damage worth £1 3s 6d to seven telegraph insulators, three panes of glass, water spouting and a wooden fence belonging to the Great Northern Railway. The magistrates were unanimous that the defendants should be severely dealt with; they ought to be flogged. In fact they were fined heavily with Norris Branston and Pacey fined £2 5s and Palmer and Tinkler, who did not appear in court, fined £2 15s. This would suggest that Bernard’s military service was only in 1917 and/or 1918, as would be expected for a man born in 1899. A Medal Index Card and entry in the Essex Regiment Medal Roll have been found for B.R. 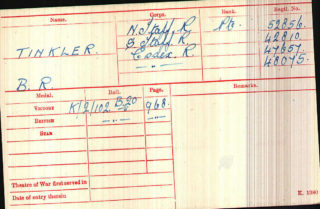 Tinkler and it is assumed that this is Bernard Robert, though unfortunately no service record has been found as many were lost in WW2. B.R. 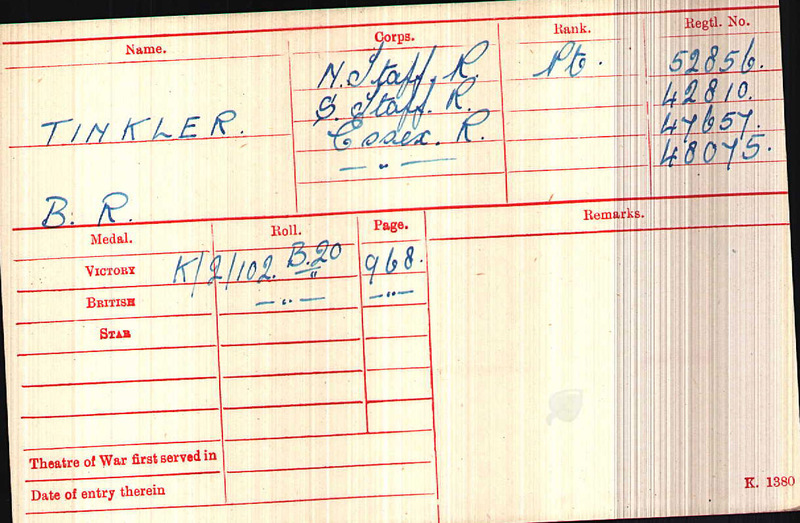 Tinkler served as a Private. 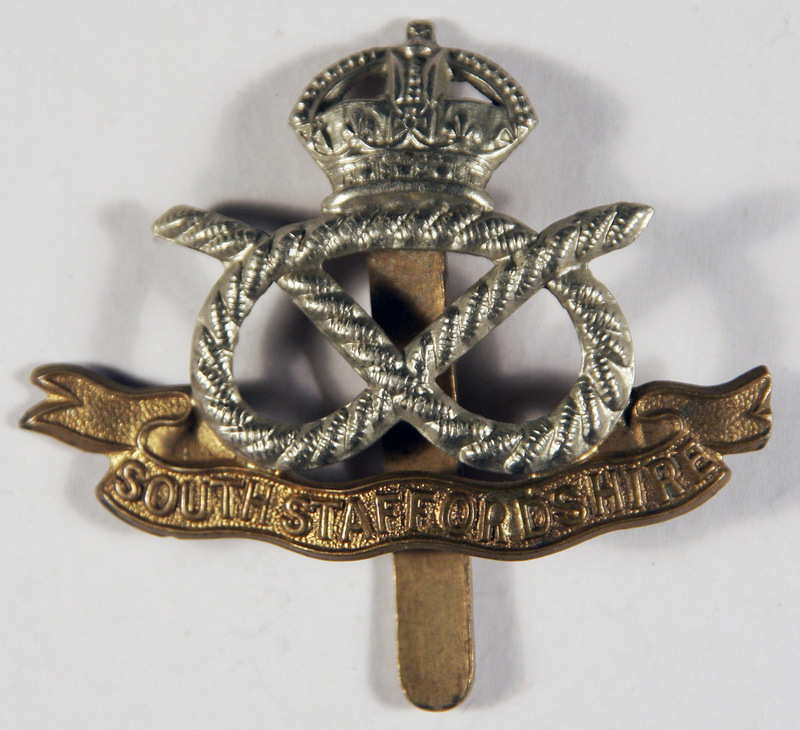 He was 52856 in the 9th North Staffordshire Regiment, then 42810 in the 4th South Staffordshires. The 9th North Staffs formed part of the 37th Division. It saw service in the 3rd Battle of Ypres in 1917, then in 1918 at Cambrai, the Somme and the Final Advance. It lost almost 30,000 men in WW1. The 4th South Staffs was part of the 7th Brigade, 25th Division. It saw service in the 3rd Battle of Ypres in 1917, then in 1918 in the The Battle of St Quentin and subsequent actions including The Battle of the Aisne. It suffered heavy losses and was reduced to cadre strength 11th July 1918 then disbanded on the 6th November 1918. B.R. Tinkler also served with the 10th Essex Regiment with successive service numbers 47657 and 48075. In 1918, the 10th Essex was part of the 18th (Eastern) Division. It too served in the 3rd Battle of Ypres, then in 1918 took part in The Battle of St Quentin and subsequent action in the 1st and 2nd Battles of the Somme, The Battle of the Hindenberg Line and Final Advance. It lost over 45,000 men in WW1. The second service number may relate to his final period on transfer to the Reserves awaiting demobilisation. Although we do not know details of Bernard Tinkler’s service career, it is clear that he must have had a hard time, and been fortunate to come home after the war. According to the medal index card, he received the Victory Medal and the British War Medal. Bernard returned to Bottesford after the war, where he was often known as Patch. He lived initially with his mother at Retford Cottages on Chapel Street. He was often in trouble for minor offences. In 1921 he was alleged to have struck a football player and was warned off all club grounds in the L.F.A jurisdiction (Grantham Journal, 5th November, 1921). In June 1924, he was described as a labourer. He was fined £1 8s 4d when along with Robert Cecil Blakey, Arthur Guy, & George Skinner he was prosecuted for wilful damage to two hovels, a cob of hay and a stack bottom to the amount £1 , the property of Robert Marriott of Bottesford (Grantham Journal, 7th June, 1924). In August 1924, he was fined £3 2s 3d alongside Robert Tinkler, Arthur Guy and William Thurlby for damage to a pear tree belonging to Isaac Whitmore to the amount 2s. Henry Whitmore, aged 11 and Cyril Spensby witnessed the four defendants throwing stones at the tree. As Bernard had two previous convictions for damage, his fine was the largest (Grantham Journal, 16th August, 1924). In July 1930, he was accused of garden pilfering two cabbages from the garden of John William Kirton. He was described as a farm labourer aged 38, living at Retford cottages, Bottesford. He was spotted coming from Mr Kirton’s allotment garden by the local policeman PC J.Crowder, and was chased. One cabbage was found cut in the allotment garden but there was no sign of the other. He was fine £2 10s with 8s 6d costs (Nottingham Journal, 8th July, 1930 & Grantham Journal, 12th July, 1930). He was again prosecuted for stealing cabbages, this time red cabbages, in December 1931 when he stole two red cabbages from the Rev F. Walford’s garden. At the time he was a farm labourer working for George Tomlinson at Elton to whom he sold one red cabbage from his own garden and two from the rector’s garden. He was found out because he dropped a distinctive Midland Railway coat button in the garden when stealing the cabbages. Police Sergeant J.T. Allen found the accused wearing a cost with the same buttons but with one missing. The magistrates initially sentenced his to 14 days hard labour but the prosecutor intervened and the sentence was changed to a fine of £3 7s with costs with the alternative of 28 days imprisonment (Grantham Journal, 8th December and 12th December, 1931). In 1932, he came 3rd in the Marrow class in the Bottesford and Muston Horticultural & Industrial Society Autumn Show (Grantham Journal, 5th November, 1932). He supported British Legion social events, particularly whist drives and dances where he won prizes in 1932, 1937 and 1944 (Grantham Journal, 5th November 1932, 23rd January 1937, 17th March 1944). He also worked the bellows for the church organ. Bernard’s father William Tinkler died in 1933 aged 80, and his mother in 1944 aged 77. Bernard Robert Tinkler did not marry and was a familiar face in Bottesford , living at 61 Chapel Street Bottesford until his sudden death on 15 March 1960. He is buried in St. Mary’s Bottesford churchyard in the same grave as his parent, William and Maria. John Tinkler – Few facts were found for Bernard’s brother John, born in 1897 or 1898. He may have been the John Tinkler who died in Grantham 1964, aged 67, but there are also records of a John Tinkler who emigrated to New Zealand in 1925, and another who enlisted in October 1914, joined the RNVR and Died of Wounds in 1915.